Who can resist a cinnamon roll? I know I sure can’t! 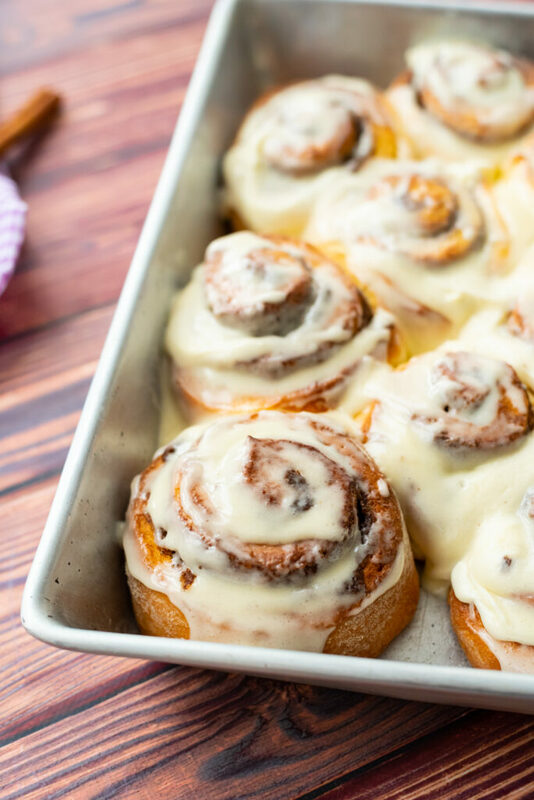 These Cinnamon rolls are soft, with a doughy texture and out of this world cream cheese frosting! Do you ever go to the mall and smell the amazing Cinnabon store from about a mile away?! Well, that is one place that is hard to pass up….or at least for me! 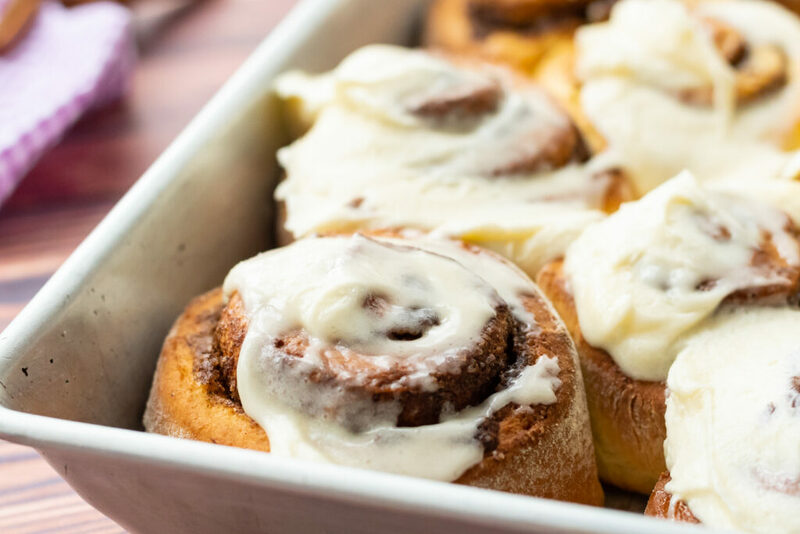 The thing that makes their Cinnabon over the top amazing is the cream cheese frosting, right?! 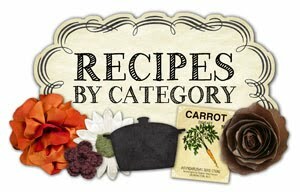 Well, look no further because this recipe may just top theirs! No more having to shell out $5+ for one cinnamon roll, why not make an entire pan for under $10? Last weekend, my hubby, who claims cinnamon rolls are “his thing” and won’t let me make them myself, whipped these up with the help of my kids! I got to sit back, drink some tea by the fire, and watch him go to work on these! I’d say I lucked out huh? He even cleaned the kitchen up afterwards, leaving zero work for me! We ended up refrigerating these overnight and popping them into the oven Saturday morning for breakfast! Not only did we all love them, but then we brought some over to my parents and they too said these were a hit! My hubby took the rest of the pan to work on Monday and his coworkers had them gone in no time! 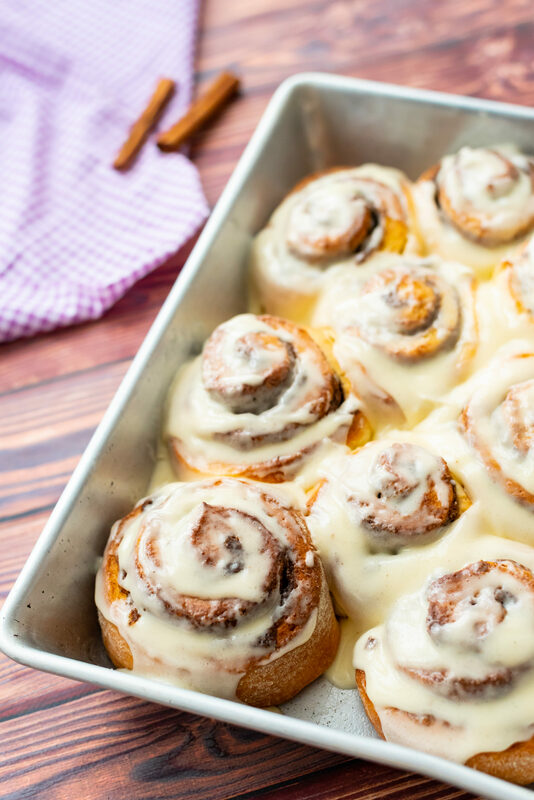 Next time you pass by a Cinnabon or see the Pilsbury rolls at the grocery store, pass them up and make this recipe instead! The cream cheese frosting alone makes these a definite winner! 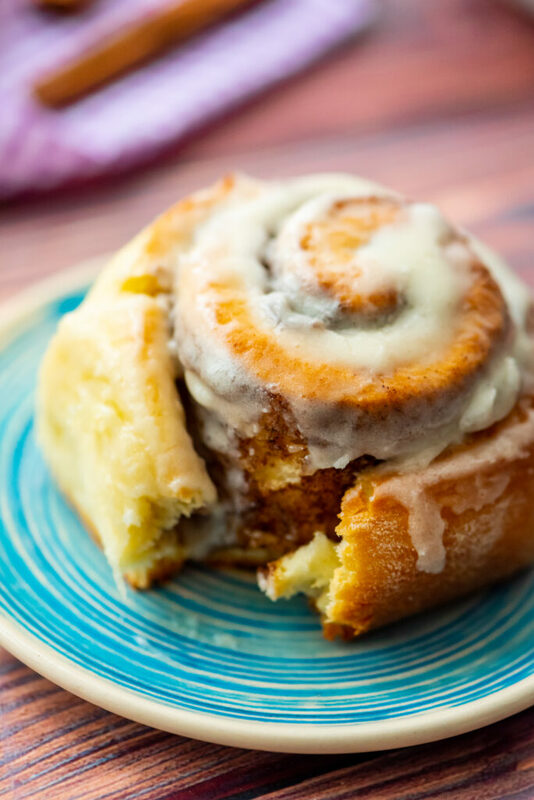 A soft, doughy, cream cheese topped cinnamon roll that may just be the best ever! Dissolve the yeast in the luckwarm milk. Let it sit for about 5 minutes. In the bowl of your mixer, add the sugar, butter, salt, eggs, and flour mixing until incorporated. Pour the yeast/milk mixture over the flour mixture and using the dough hook, mix until incorporated. Place the dough into an oiled bowl and cover. Allow to rise for about an hour, or until doubled in size. On a floured surface, roll the dough out until it is 16 inches by 13 inches. It should be about 1/4 inch thick. Spread the butter evenly over the dough and sprinkle the cinnamon/sugar mixture on top. Carefully roll the dough up and cut into 1 1/2 inch thick slices. Place slices into greased baking pan and cover with a towel for another 30 minutes to rise. Place pan into oven and bake for around 20 minutes, or until golden brown. While the rolls are baking, combine the icing ingredients. 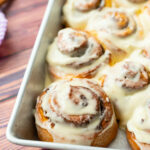 Once rolls are removed from oven, spread icing generously over each roll and serve! 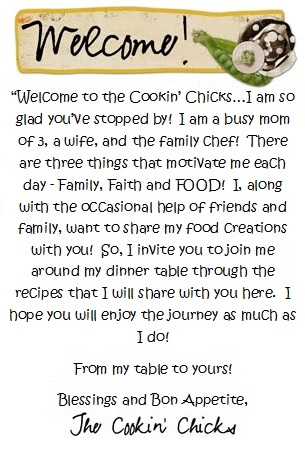 Awww, I am so glad you are enjoying the recipes!! Thanks so much for sharing them too!!! I just mixed up the dough for the cinnamon rolls, but it didn’t look as moist as yours. It’s rising now, hope it rises and turns out ok.
Actually a bit more dry of dough makes it easier to work with! Keep me posted!